Two-piece pajamas with pullover or front buttoned top. Patch pocket, long or short sleeves. Buttoned style has collar and applied sleeve bands. Pullover style has applied neckband. Elastic stitched in at waistline of trousers. Boys' Size 12, Chest 30, Waist 25.5, Hip 31. Pattern is complete. The pieces have been meticulously cut and folded. Envelope is in very good condition. 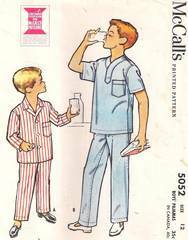 This is an original vintage sewing pattern from 1959.